The Saunders-Roe SR.45 Princess was a British flying boat aircraft developed and built by Saunders-Roe at their Cowes facility on the Isle of Wight. It has the distinction of being the largest all-metal flying boat to have ever been constructed. The Princess had been developed to serve as a larger and more luxurious successor to the pre-war commercial flying boats, such as the Short Empire. It was intended to serve the transatlantic route, carrying up to 100 passengers between Southampton, United Kingdom and New York City, United States in spacious and comfortable conditions. To achieve this, it was decided early on to make use of newly developed turboprop technology, opting for the in-developed Bristol Proteus engine to power the aircraft. The project suffered delays due to difficulties encountered in the development of the Proteus engine. On 22 August 1952, the first prototype Princess, G-ALUN, conducted its maiden flight. Between 1952 and 1954, the first prototype performed a total of 47 test flights, including two public appearances at the Farnborough Airshow. This work was carried out under a development contract for the Ministry of Supply, the intention being that this would lead to a contract for the aircraft from British flag carrier British Overseas Airways Corporation (BOAC). Although the initial development contract had been successfully met, BOAC eventually decided to focus on its land-based routes using the jet-powered De Havilland Comet instead. The era of the large flying boat had effectively ended prior to the aircraft's completion. Work on the Princess was ultimately cancelled after having produced three examples, only one of which flew. By the mid-1950s, large commercial flying boats were being increasingly overshadowed by land-based jet airliners. Factors such as runway and airport improvements had added to the viability of land-based aircraft, which did not have to compromise to accommodate the additional weight and drag of the boat hulls that were necessary on seaplanes, or the mitigating measures needed against the corrosion caused by seawater. Following the project's termination, the three airframes were stored with the intention of selling them on; however, upon receipt of a promising offer for the aircraft, it was found that corrosion had set in while in storage. As a result, all three airframes were scrapped. 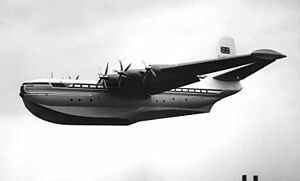 Before the Second World War, British airline Imperial Airways had successfully used large long-range passenger flying boats such as the Short Empire and Short S.26 to build up a network of long distance routes. These flying boats had not only pioneered new aerial routes across the British Empire which had previously not been served at all, passengers were transported within an unprecedented level of comfort, being provided with luxurious first class accommodation, including a promenade, sizable galley, separate bathrooms for men and women, and individual cabins for passengers. However, operations of these flying boats had been disrupted by wartime, during which Imperial Airways had also merged with British Airways Ltd to form British Overseas Airways Corporation (BOAC) in 1940. While restricted operations of commercial flying boats did continue, such as the use of Boeing 314s for the transatlantic route, many were requisitioned for service with the Royal Air Force (RAF) where they were typically used as maritime patrol aircraft. During the pre-war era, flying boats had been preferred for conducting long distance flights as, unlike their land-based counterparts, they were not limited by available runway length – the majority of which were still grass-surfaced at this point – and as a long range aeroplane would be required to carry a large load of fuel, a larger size of the aircraft could be permitted without needing to cater for factors such as limited runway and airfield sizes. In addition, for services to far-flung parts of the British Empire, the ability to land and take-off from any available area of water was a distinct advantage for services to such places, many of which at the time had no airport facilities at all. With the end of the Second World War, flying boats services were resumed with other types being operated, such as the Short Hythe, Short Sandringham, and Short Solent. However, the war had also produced a legacy of large runways and sizable airports formerly used for military purposes that could now meet the needs of a larger generation of land aircraft. Even prior to the war's end, the British Air Ministry was enthusiastic on the prospects for reviving the shuttered flying boat routes. The Ministry approached two British flying boat manufacturers – Saunders-Roe (Saro) and Shorts – requesting that the two firms collaborate on the development and manufacture of a new aircraft, which would emerge as the Short Shetland. As such, Saunders-Roe designed the Shetland and manufactured the wing while Shorts produced the remainder of the aircraft. While two examples of the Shetland were completed, the project was considered a failure and the pair of flying boats were scrapped in 1951. Saunders-Roe considered the Shetland to have not resembled the flying boat that they sought to develop, but was otherwise a useful learning experience; even prior to the Shetland, the company had wanted to develop a more revolutionary flying boat. During 1943, the chief designers of Saunders-Roe and Short had collaborated to produce a preliminary design specification for an innovative large flying boat. This design specification defined various criteria for the proposed aircraft, which would be the largest all-metal flying boat ever built; performance criteria included a weight of 140 tons, a pressurised 'double-bubble' hull, a 214-foot wingspan, a height of 55 feet 9 inches, and a length of 148 feet. The proposed aircraft would be capable of a cruising speed of 340 MPH at an altitude of 37,000 feet, a range (dependent on payload) of 5,190–3,640 miles, and be outfitted luxurious accommodation for a total of 104 passengers. During 1945, in response to an approach made by the British Ministry of Supply, which had been seeking design submissions from aviation companies for an envisioned new long range civil flying boat, which was to operate in BOAC's fleet to operate its transatlantic passenger services, Saunders-Roe decided to submit a bid based upon the earlier collaborative design specification. Following evaluations of a range of different propulsion methods and configurations, the design team selected the in-development Bristol Proteus – one of the first turboprop engines – to meet the enormous power requirements of the proposed giant flying boat. In May 1946, the bid made by Saunders-Roe was selected as the winner, leading to the company receiving an order for the production of three SR.45 flying boats. Work on the SR.45 commenced almost immediately upon receipt of the order. From an early stage in development, progress on the programme was subject to schedule overruns and higher than projected costs being incurred, leading to scepticism of the flying boat's viability within the House of Commons, which was being increasingly regarded as a high-risk initiative with unreliable costing. Specifically, designing and testing of the airframe, as well as the independently-conducted development of the Proteus engine to power the SR.45, had been major contributors to the higher-than-expected costs. In 1951, BOAC performed an in-depth reevaluation of its standing requirements, and determined that the airline presently had no need for the Princess, or any new large flying boat. The airline had already elected to terminate its existing flying boat services during 1950. In late 1951, it was announced that construction of the three Princesses would proceed with the intention of using them as transport aircraft in RAF service. However, in March 1952, it was announced that while the first prototype would be completed, the second and third would be suspended to await more powerful engines. On 22 August 1952, the prototype, G-ALUN, conducted its maiden flight, piloted by Geoffrey Tyson. The initial flight lasted for 35 minutes, in which the flying boat performed a complete circumnavigation of the Isle of Wight. According to aviation author Phillip Kaplan, the Princess had not been intended to fly that day at all and only taxiing tests had been scheduled to take place, and that Tyson had decided to proceed due to the excellent conditions present on the day. The prototype was quickly put through several test flights with the hope of being able to sufficiently ready the flying boat to appear at the 1952 Farnborough Airshow, however indications of engine reliability issues were encountered and this led to the intended flight display at Farnborough that year being abandoned. As further testing of the prototype continued, the reliability of the engines and gearboxes continued to be problematic, but not to the extent that flight testing was prevented. Evaluation of the flying boat continued into 1953, during which particular attention was devoted towards addressing the difficulties uncovered. During the 1953 Farnborough Airshow, the prototype was displayed. Flight tests of the prototype continued up until 27 May 1954, by which point it had been found that the Proteus engine, once perfected, would be capable of enabling the type to achieve its envisioned performance figures. G-ALUN was the only model to fly, performing 46 test flights in total during which 100 hours flight hours were accumulated. Princess Air Transport Co Ltd was formed with the object of studying the factors affecting the operation of the Princess flying boats and to tender for their operation should the opportunity have arisen. The company's directors were M D N Wyatt (chairman), Sir Archibald Philip Hope, 17th Baronet, Geoffrey Tyson, P D Irons and Capt H W C Alger (general manager). 75 per cent of the share capital were held by Saunders-Roe Ltd and the balance by Airwork Ltd. Following the completion of flying tests performed by the prototype, the British government exercised considerable indecision over the fate of the programme. In addition to the prototype, a further two Princesses (G-ALUO and G-ALUP) were under construction, but these would ultimately never fly. While a decision from the government was effectively pending, the three existing aircraft were placed into storage, being cocooned and retained, one at Cowes and two at Calshot Spit; it had been hoped that work on the programme would be restarted when a buyer was found. Over the ensuing years, several offers were issued with the intention of purchasing the Princesses, including two proposals which would have involved re-engining them with Rolls-Royce Tynes. In 1954, Aquila Airways had offered £1 million each for the stored Princesses, but this offer was rejected. In 1957, Saro itself had proposed the conversion of the aircraft to serve as landplane troop carriers/freighters. In 1964, the three Princesses were all purchased by Eoin Mekie on behalf of Aero Spacelines, who planned to use them as heavy-duty freight aircraft for transporting Saturn V rocket components for NASA. When the cocooning was removed, it was found that they were badly corroded (the contract for maintenance and inspection of the stored aircraft had been allowed to lapse, which resulted in the airframes deteriorating rapidly), and all three Princesses were broken up by 1967. They were the last fixed-wing commercial aircraft produced by Saunders-Roe. The company constructed one more fixed-wing design, the Saunders-Roe SR.53 mixed-power (rocket and turbojet) fighter design; aside from that venture, the company primarily concentrated its efforts on helicopters and hovercraft after this point. In 1958, information on the Princess was shared with the United States Navy, who were at the time examining the possibility of converting the three stored aircraft to make use of nuclear power. This interest resulted in a delegation from Saro being dispatched to the US for the purpose of discuss a sale of the preserved Princesses. However, this interest ultimately amounted to nothing. In the wake of the success of his Pregnant Guppy, constructor Jack Conroy discussed his concepts for other outsize transports with Air Progress in their publication, World's Greatest Aircraft (Petersen Publications, 1973). Conroy considered the creation of an outsize transport from the Princess to have been basically feasible, in that it shares a sectional 'double-bubble' fuselage construction similar to that of the Boeing Model 377 Stratocruiser, on which the Guppies were based. The reason for considering producing such an aircraft was the desire of NASA to possess a means of transporting first stage of the Saturn V rocket by air, if this were possible, to Cape Canaveral; the ability for the aircraft to conduct a water landing would also be advantageous for proximity landing at sea, or on nearby lakes in Florida. Ultimately, this plan was deemed to be impractical, though the existing Guppies continued to function throughout the Apollo program as efficient air transport of the outsize hardware used in these missions. Conroy quipped that the British were "offended when we named our aircraft 'The Pregnant Guppy'. Man, can you imagine what they would have said if we produced 'The Pregnant Princess' !" The SR.45 Princess was a large flying boat, being the largest all-metal flying boat to have ever been constructed. The Princess featured a rounded, bulbous, "double-bubble" pressurized fuselage which contained two full passenger decks; these decks had sufficient room to accommodate up to 105 passengers in great comfort. The planing bottom of the hull had only a slight step in the keel to minimize drag in the air. The Princess was powered by an arrangement of ten Bristol Proteus turboprop engines. These engines drove six sets of four-bladed propellers; of these, the inner four propellers were double, contra-rotating propellers which were driven by a twin version of the Proteus, named the Bristol Coupled Proteus, each engine drove one of the propellers. The two outer propellers were single and each powered by a single engine. The cockpit of the Princess was designed to be operated by a pair of pilots, two flight engineers, a navigator, and a radio operator. Early on, it had been intended for the aircraft to be outfitted with some form of powered flight controls, including an early fly-by-wire implementation, in order that pilots would be able to effectively actuate its large control surfaces, which would have to overcome equally larger forces. However, it was decided to opt for a traditional mechanical linkage approach that was augmented by a series of electrically-driven power assist units to effectively support actuation instead. The ailerons and rudder were split into multiple sections in order that, if a part of the servo-powered control system were to fail, a faulty section could be "trailed" so that it did not act against the remaining working sections. While the prototype aircraft had been fitted with advanced (but conventional) hydraulic controls, Saunders-Roe had intended production aircraft to use an analogue system based around electrical servos with hydraulic final control actuators. Such a system had been built and undergone ground-testing, but the Princess had been terminated prior to any aircraft having been fitted with the system. Wingspan: 219 ft 6 in (66.90 m) with wingtip floats retracted. 209 ft 6 in (63.86 m) floats extended. Fuel capacity: 14,000 imp gal (63,645.3 l; 16,813.3 US gal) in four integral inner wing tanks. ^ Maximum continuous power of a Proteus was 2,050 hp (1,529 kW) + 700 lbf (3.11 kN) residual thrust at 9,500 rpm at sea level. ^ "In pictures: Flying boat's maiden flight celebrated." BBC News, 18 August 2012. ^ a b Kaplan 2005, p. 196. ^ Kaplan 2005, pp. 196–197. ^ Kaplan 2005, pp. 197, 200, 204. ^ a b c Kaplan 2005, p. 200. ^ a b c d e f g h i Kaplan 2005, p. 204. ^ a b Bridgman 1953, p. 88. ^ a b c d e f g h i Kaplan 2005, p. 205. ^ "Cover Art." Flight International, 16 November 1951. ^ Flight 1952, p. 422. ^ Hull 2002, p. ?. ^ London 1988, pp. 229–230. ^ a b London 1988, pp. 230–231. ^ "Saunders-Roe S.R.4S Princess." Flight, 3 September 1954, p. 338. ^ London 2003, p. 246. ^ London 1988, pp. 312–313. ^ London 2003, p. 250. ^ "U.S. Given Data On Flying-Boats – Use Of Nuclear Power". The Times, Monday 3 February 1958, Issue 54065. p. 5, column A. ^ Air Progress, World's Greatest Aircraft, Chapter: 'The Guppies', concluding paragraph. ^ Flight 1952, p. 412. ^ London, Peter (1988). Saunders and Saro Aircraft since 1917. London: Conway Maritime Press Ltd. pp. 210–235. ISBN 0 85177 814 3. ^ London 2003, p. 282. ^ Flight & 26 September 1952, p. 413. ^ Saunders-Roe Report FT/15/0/24 Part 1. MAEE Felixstowe. January 1955. Bridgman, Leonard. Jane's All The World's Aircraft 1952–53. London: Jane's, 1953. "Concerning flying boats". Flight, 6 July 1951. pp. 10–11. "Flying ship on the stocks" Flight, 16 March 1950, pp. 344–345. Hull, Norman. Flying Boats of the Solent: A Portrait of a Golden Age of Air Travel. Silver Link Publishing Ltd., 2002. ISBN 1-85794-161-6. Kaplan, Philip. "Big Wings: The Largest Aeroplanes Ever Built." Pen and Sword, 2005. ISBN 1-84415-178-6. London, Peter. British Flying Boats. Stroud, UK: Sutton Publishing, 2003. ISBN 0-7509-2695-3. London, Peter. Saunders and Saro Aircraft since 1917. London, UK: Conway Maritime Press Ltd, 1988. ISBN 0-8517-7814-3. "Ten Turboprops Power Giant Flying Boat." Popular Science, August 1949. "A winged ship takes form." Flight, 7 December 1951, p. 724. Wealthy, Bob (29 January 2009). "Saunders Roe and the Princess Flying Boat" (PDF). Solent Aeromarine Enterprises. Wikimedia Commons has media related to Saunders-Roe Princess. This page was last edited on 9 April 2019, at 05:33 (UTC).